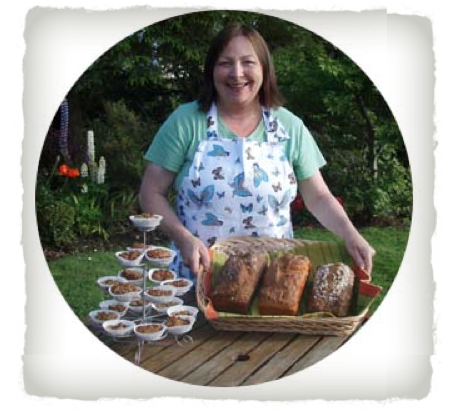 The 5th in this series is written by Cathy Whitty, one of the 2 owners of this brand. 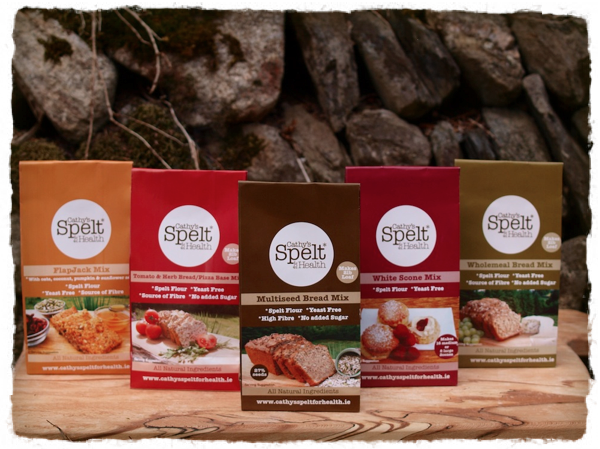 Happily Spelt for Health won a Joint Gold in the Cake & Breads Mix category at the Blas na hEireann awards last night – adding another to their shelf of awards which also contains a two star Gold Great Taste Award. We are in business just two years and if we are to continue we needed to take it up a notch. Our old bags were brown paper with a label back and front. The same great graphic designer has been involved with us from day one and designed and manages our website. Catherine Murray is a completing her degree at the moment. The brown bags were great in the beginning as we didn’t have to order in huge volumes and we could order labels in small batches so it was easier to manage cashflow. 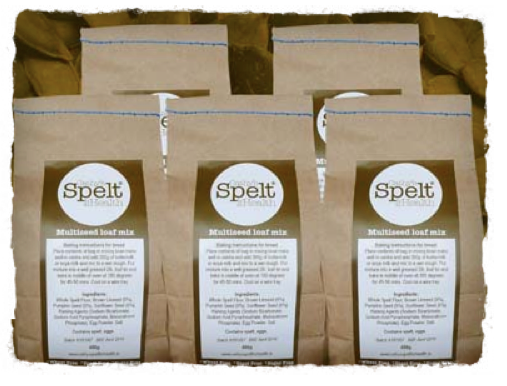 However the downside was the labelling by hand very time consuming; it took an hour to label 100 bags so as our orders started to grow it was just impractical. Also as our flapjacks contain coconut it left little oily stains on the bags. So once we knew there was enough demand the time had come to get new packaging. We were luck to have a mentor, Lisa Cunningham of Vogue Business Development assigned to us by Wicklow County Enterprise Board. Lisa looked at our products range, five products, five colour ranges. We were so nervous about going so colourful after our brown bags which we felt were earthy and natural looking. Cathy our graphic designer did several mock ups of different colour schemes, different layouts however the most important thing was that they all had to complement each other on a shelf. Next up was the photograph which is on the front panel of the bag. We are a start up company and on a shoe string budget so we were left to take the photos ourselves. This part was the most frustrating, trying to get the photo just right. We used the surrounding landscape as our backdrop to all the photos. It took many many attempts until eventually we agreed on the photos. We though we were ready to print, the design had been finalised, bags proof read and we decided to check that what we were writing on the actual bags complied with the current food safety legislation. The food safety authority were so helpful and read all our labels and it turned out we had to delete so much text from the bags. This could have been a very very costly mistake. A word of warning is get your packaging approved before you print!. 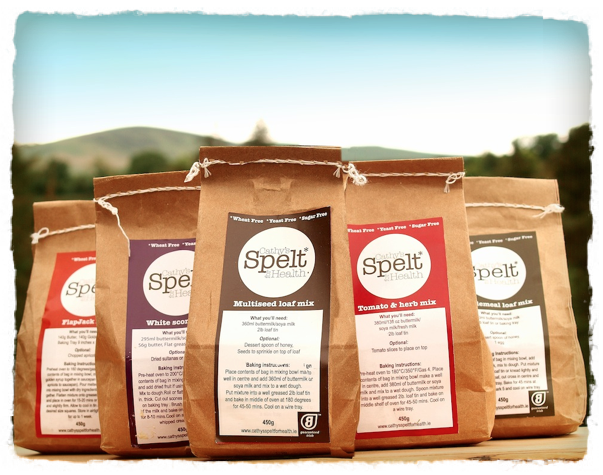 Our new bags now comply with EU legislation and we are ready to start exporting in the coming months. The one day workshop which will be run by Teagasc on October 18th ‘Package your Way to New Markets’ would be well worth attending and could save a lot of headaches if you are redesigning or rebranding your existing packaging! Thank you for taking the time to share that Cathy – much appreciated. You can see the other posts in this series here.